I was told once that I should read the ENTIRE error message when one appears on my screen and not assume that I just know what is happening. Of course, some error messages that are provided to the user are way too simple and very un-helpful (I think of “Something Went Wrong” message in SharePoint). BUT, sometimes, the error message or Pop Up is actually quite descriptive, if we would just read the whole thing. 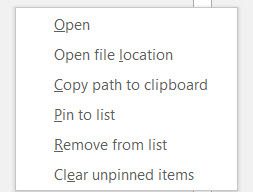 In Microsoft Project Professional, when you try to open a file and you click on the shortcut you might get a pop up that appears to be an error. BUT – you get an error. If you are like me, you read that first sentence that says “This project is on Project Web App” and you immediately think that you must have it open in PWA and that it is not checked in OR, maybe your cache isn’t right, OR, maybe somebody else has it open in PWA, or, or, or….. And, you might hit OK and then go look at those things – only to discover that it is not checked out already or any of the other conclusions that I jump to. BUT, read the second sentence that says, “To open it, you’ll need to close and then restart Project using that Project Web App account.”. It took me a few times but then it hit me that the solution was actually being given to me. Let’s go back to steps two and three where I have now circled the problem. The problem is that I am in the PWA instance called “DEMO” and I was trying to open a file from the PWA_DEV instance. In my case, I have 3 files from the PWA_DEV instance, 1 from the PWA instance and 2 from the DEMO instance. The only ones that will open for me are the 2 from the DEMO instance. If you go to multiple instances, you will need to pay attention to the Recent files and their locations. Since the first part of this article is about the fact that this is not really an error, let me quickly provide one that I occasionally run into that actually is a problem – but it is user based and not the system. So, it is an appropriate error message. But, the message is sometimes a bit odd. Check that the file name and path are correct. Check that the file format is recognized by Project. Project files saved in a version earlier than Microsoft project 2000 can’t be opened. That message is appropriate when I delete a file because the Recent list still shows it – but it isn’t there anymore so I do the first thing it says -Check the file name and path I will see that it is not where I think it should be.